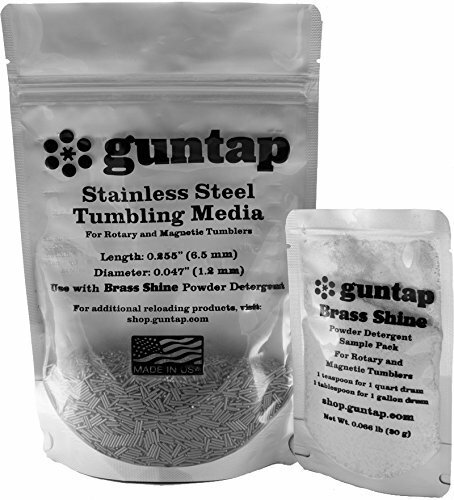 Stainless Steel Tumbling Pins 2.5 pound package by guntap is the best tumbling media to clean, polish, and deburr metals. Ideal for handloaders who use a rotary tumbler or magnetic tumbler to clean their brass cartridges. The media can be used with brass cases with any primer pocket or flash hole size without fear of having stuck pins. Bonus: Receive a 30 gram (0.066 pound) sample pack of Brass Shine detergent to use with your stainless pins. No need to create your own recipe using dish detergent and a water softener. Brass Shine works with all type of water. Just add 1 tsp for a 1 quart drum or 1 tbsp for a 1 gallon drum and you're ready to go. 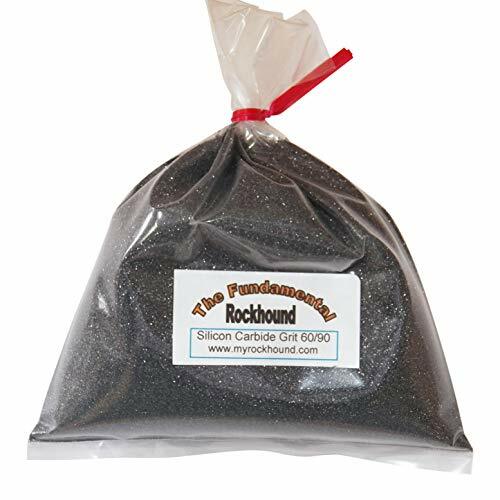 Two pounds Coarse size 60/90 silicon carbide grit for rock tumbling. 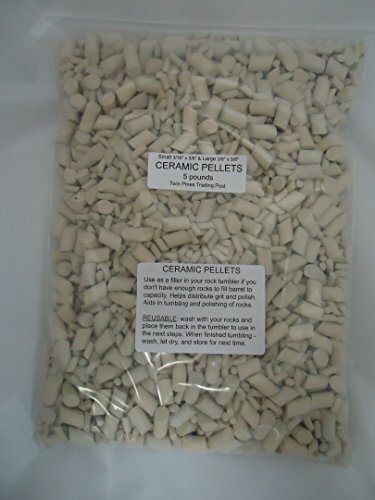 Mixed ceramic pellets. Cylinder shape with beveled ends. Mix of two sizes - approximately 3/8"x 5/8" and 3/16" x 3/8". Used as a filler in rotary and vibratory rock tumblers. Helps distribute grit and polish. The same pellets can be reused with the same rocks in all grit and polish steps. Wash with rocks and place back in barrel for next step. Reusable - When done clean, dry, and store until needed again. 2 1/2 pounds of each size. 5 pound quantity. Ships USPS Priority Mail. 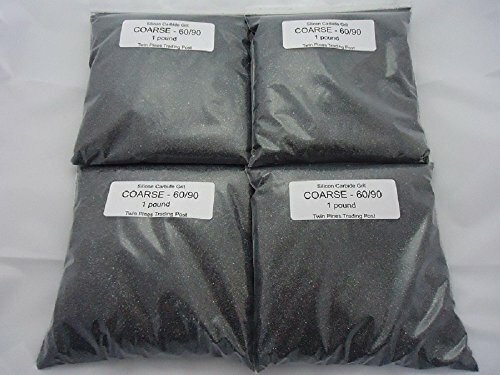 Tumbling grade 60/90 coarse silicon carbide grit. For use in a rotary rock tumbler as the first step in the tumbling process. 4 pound quantity. Ships USPS Priority Mail. 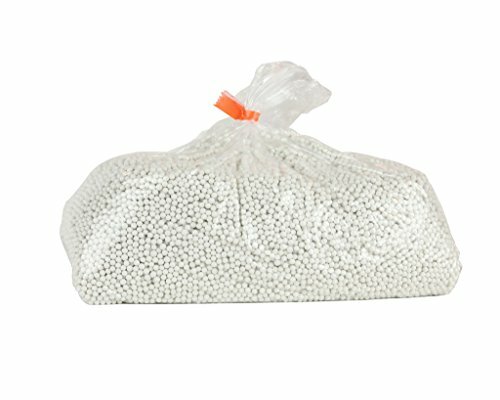 60/90 silicon carbide grit - 4 lbs. 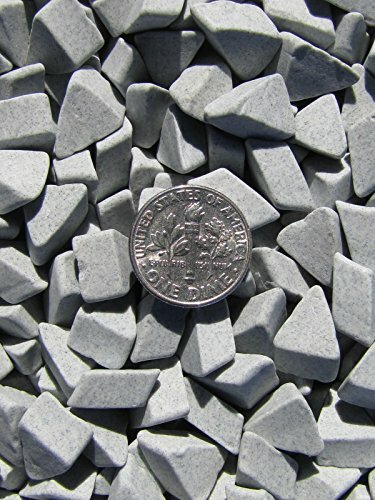 Product Specifications: *Manufacture: Manufactured in USA *Model: M General Purpose Grey Abrasive *"Note: Coin in picture not included, for scale purposes only." Porcelain balls are utilized to achieve bright finishes without the use of steel media. Because of its shape, it imparts a single point of contact resulting in a very fine finish to almost any area it can REACH. Porcelain balls will not leave impingement marks that steel media produces on some other softer metals and/or flat surfaces. Their lighter weight lessens the distortion potential for lighter work and wire forms. Very popular for delicate parts, fine edge blanking and precious metal burnishing. Use with Raytech compound D. Mixing the sizes is recommended for good Vibratory action. Please note that a break-in period of 4 to 6 hours is required. Density: 125 lbs/cu ft. 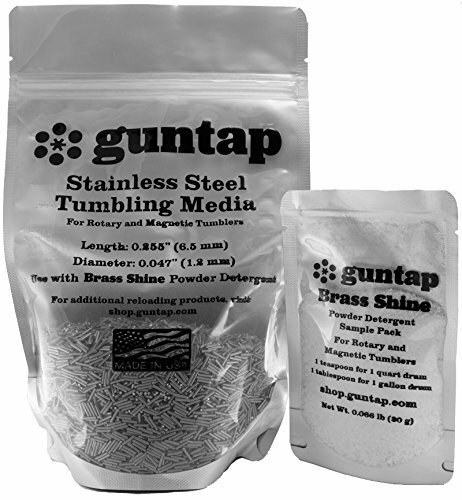 Stainless Steel Tumbling Pins 1 pound package by guntap is the best tumbling media to clean, polish, and deburr metals. Ideal for handloaders who use a rotary tumbler or magnetic tumbler to clean their brass cartridges. The media can be used with brass cases with any primer pocket or flash hole size without fear of having stuck pins. 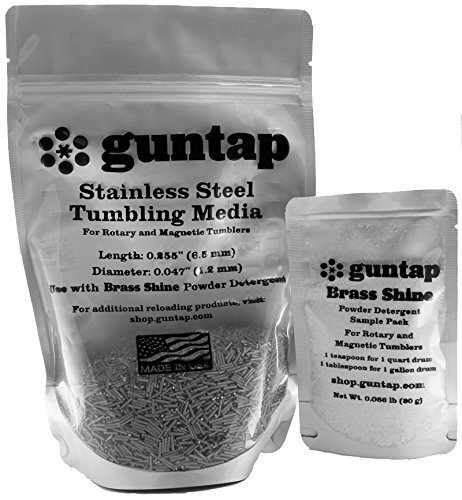 Stainless Steel Tumbling Pins 5 pound package by guntap is the best tumbling media to clean, polish, and deburr metals. Ideal for handloaders who use a rotary tumbler or magnetic tumbler to clean their brass cartridges. The media can be used with brass cases with any primer pocket or flash hole size without fear of having stuck pins. 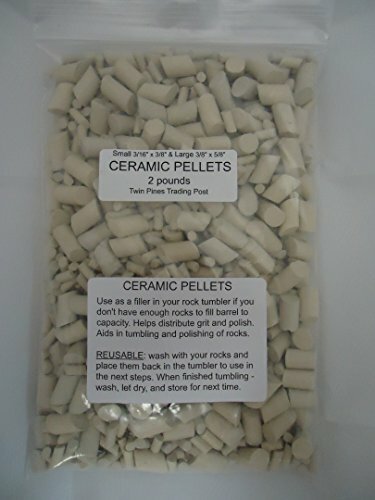 Mixed ceramic pellets. Cylinder shape with beveled ends. Mix of two sizes - approximately 3/8"x 5/8" and 3/16 x 3/8". Used as a filler in rotary and vibratory rock tumblers. Helps distribute grit and polish. 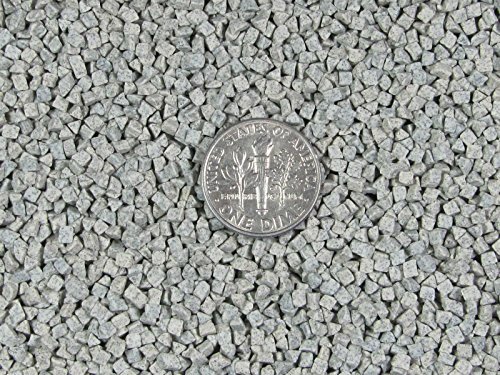 The same pellets can be reused with the same rocks in all grit and polish steps. Wash with rocks and place back in barrel for next step. Reusable - When done clean, dry, and store until needed again. One pound of each size. 2 pound quantity. Ships USPS Priority Mail. 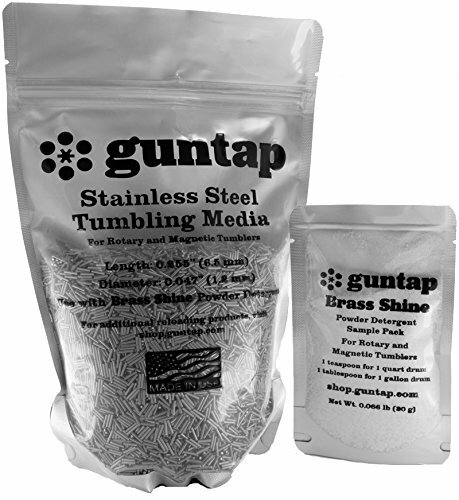 Stainless Steel Tumbling Pins 2 pound package by guntap is the best tumbling media to clean, polish, and deburr metals. Ideal for handloaders who use a rotary tumbler or magnetic tumbler to clean their brass cartridges. The media can be used with brass cases with any primer pocket or flash hole size without fear of having stuck pins. 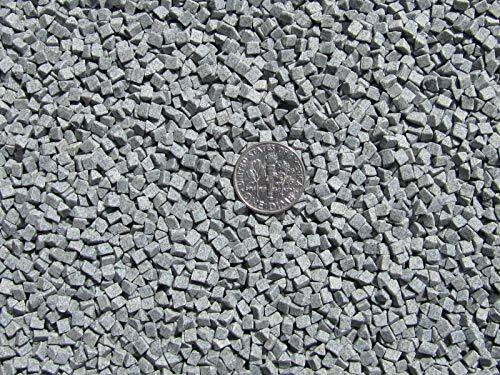 Five pounds Very Fine size 500 straight silicon carbide grit. 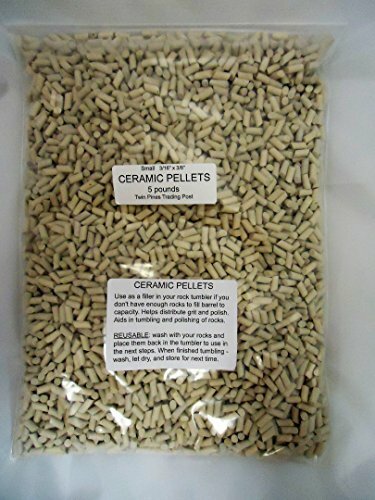 Large ceramic pellets. Cylinder shape with beveled ends. Approximately 3/8"x 5/8". Used as a filler in rotary and vibratory rock tumblers. Helps distribute grit and polish. The same pellets can be reused with the same rocks in all grit and polish steps. Wash with rocks and place back in barrel for next step. Reusable - When done clean, dry, and store until needed again. 5 pound quantity. Ships USPS Priority Mail. 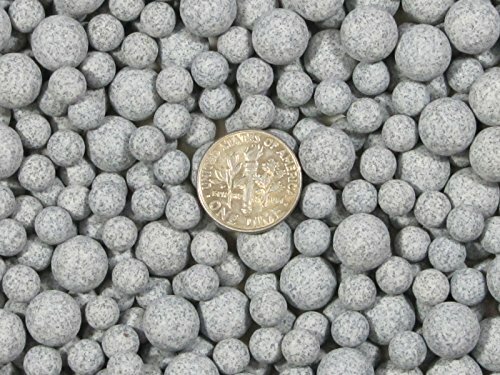 Ceramic Tumbler Pellets - Small. 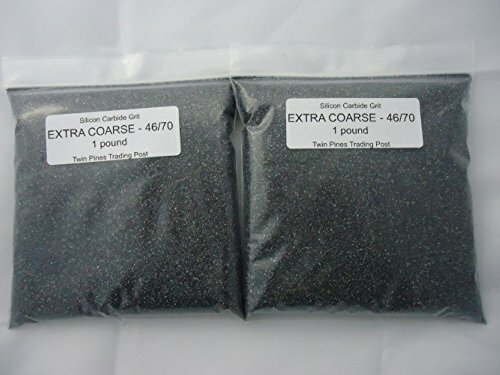 Extra Coarse 46/70 Silicon Carbide Grit -2 lbs. Tumbling grade 46/70 extra coarse silicon carbide grit. 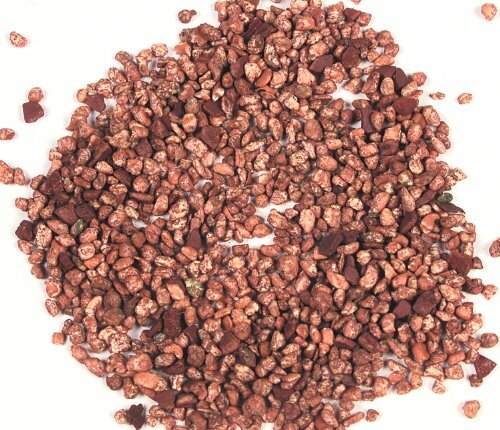 For use in a rotary rock tumbler with extra rough rocks, prior to the standard 4 step tumbling process. 2 pound quantity. Ships USPS Priority Mail. 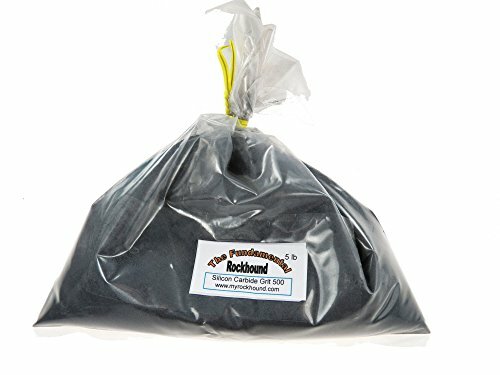 46/70 silicon carbide grit - 2 lbs. Raytech corncob based media treated with Raytech's proprietary polishing compound and is clean to use as rouge stain is eliminated. Performs equal or better than Dri-Shine I. Density: 30 lbs/cu ft. Size: 15lbs. 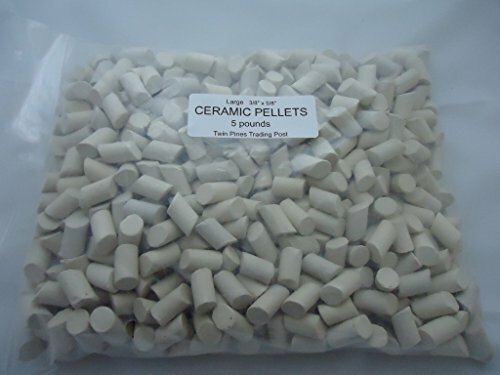 Small ceramic pellets. Cylinder shape with beveled ends. Approximately 3/16" x 3/8". Used as a filler in rotary and vibratory rock tumblers. Helps distribute grit and polish. The same pellets can be reused with the same rocks in all grit and polish steps. Wash with rocks and place back in barrel for next step. Reusable - When done clean, dry, and store until needed again. 5 pound quantity. Ships USPS Priority Mail.